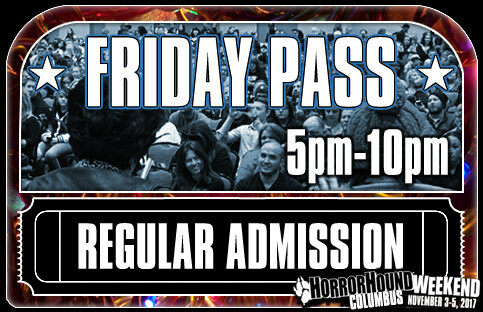 Admission into HorrorHound Weekend during normal business hours on FRIDAY, November 3rd, 2017 (Hours: 5pm-10pm). Ticket grants admission into the convention with access to the vendor, celebrity, and Q&A panels. *Due to space capacity issues, Single Day Tickets Must be used on the day specified on said-ticket. 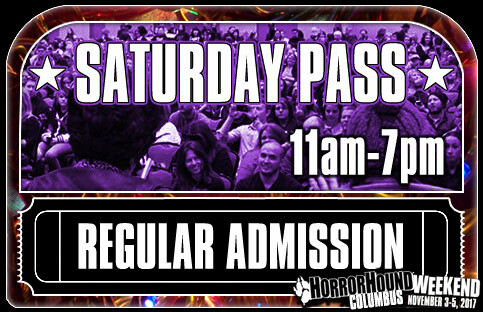 Admission into HorrorHound Weekend during normal business hours on SATURDAY, November 4th, 2017 (Hours: 10am-7pm). Ticket grants admission into the convention with access to the vendor, celebrity, and Q&A panels. 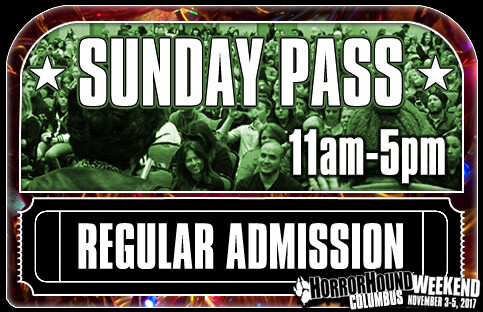 Admission into HorrorHound Weekend during normal business hours on SUNDAY, November 5th, 2017 (Hours: 5pm-10pm). Ticket grants admission into the convention with access to the vendor, celebrity, and Q&A panels. 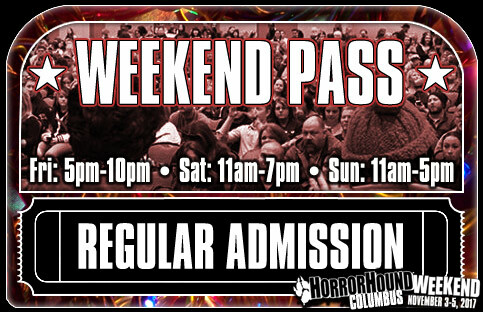 Admission into HorrorHound Weekend: Columbus during normal business hours ALL WEEKEND – November 3-5th, 2017 (Hours: Friday: 5pm-10pm, Saturday: 11am-7pm, Sunday: 11am-5pm). Ticket grants admission into the convention center with access to the vendor, celebrity, Q&A panels, screenings, and after hour events. 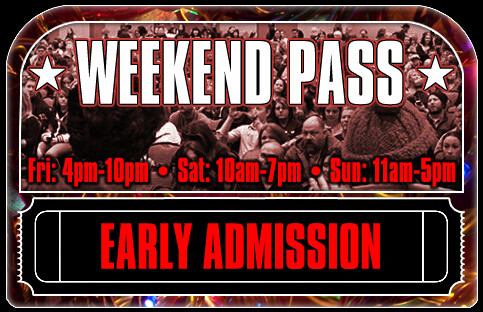 Admission into HorrorHound Weekend during normal business hours ALL WEEKEND – November 3-5th, 2017 – with one-hour early admission into the event Friday and Saturday! (Early Admission Hours: Friday: 4pm-10pm, Saturday: 10am-7pm, Sunday: 11am-5pm). Ticket grants admission into the convention center with access to the vendor, celebrity Q&A panels, film screenings and after hour events. 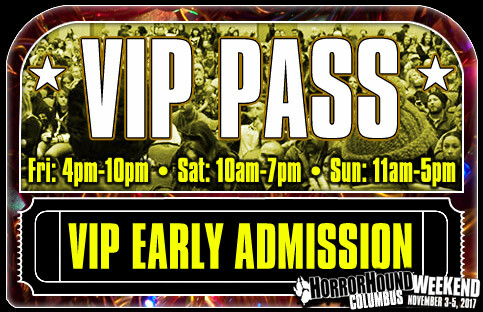 This ticket grants holder admission into HorrorHound Weekend during normal business hours ALL WEEKEND – November 3-5th, 2017 – with one-hour early admission into the event Friday and Saturday! (Early Admission Hours: Friday: 4pm-10pm, Saturday: 10am-7pm, Sunday: 11am-5pm). Ticket grants admission into the convention center with access to the vendor, celebrity, Q&A panels, film screenings, and guaranteed access to after hour events. **Please note: Past unused HHW event VIP tickets cannot be used for this event. If you have unused VIP event tickets from prior shows, they can be used at our March 23-25 Cincinnati event. Furthermore, the Columbus VIP ticket cannot be used for any future HHW event. Tickets must be used at this particular show – and all item(s) must be picked up during show hours.